Lights... Camera... TEACH! : A Gift for Me, a Gift for You, and a Happy New Year!!!! A Gift for Me, a Gift for You, and a Happy New Year!!!! Ok, I know that I am a day early for New Year's Day but it seems like these days, I just can't seem to get things done in a timely manner. I mean, I'm on vacation.... VA.CA.TION.... and I still feel busy??!!! It must have been all the prepping for the holidays, then the actual holiday, and then the aftermath of the holidays. 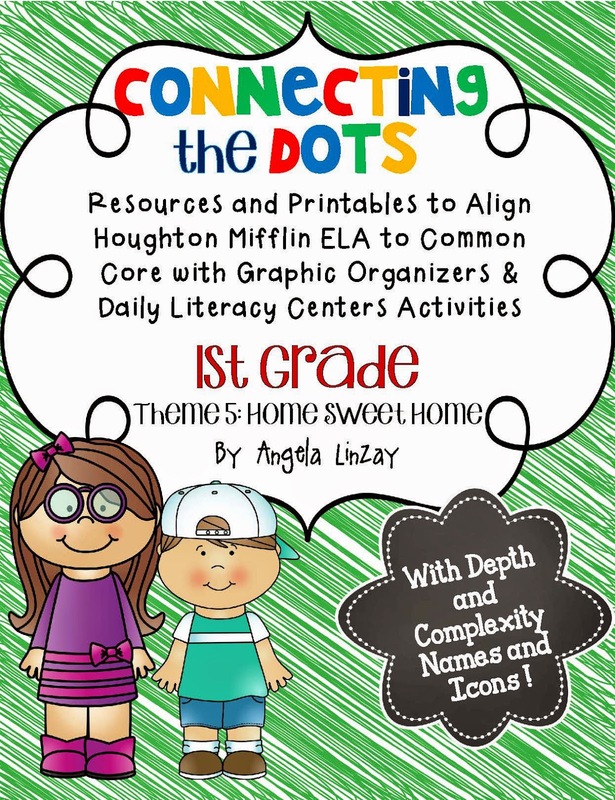 One thing that I was able to finish is my latest Houghton Mifflin unit for first grade. I felt like I was dragging my feet with this one because it took me longer than usual to complete it. In reality, every time I would *think* about sitting down at my computer to work on it, something else came up. THEN when I would finally get a chance to sit, I would just stare at the computer screen. Seriously... just.STARE. It was weird. I wanted to share with you 3 things today (hence the name of this post). I wanted to share with you my favorite Christmas gift! Ever since I've started eating paleo, I've been enjoying cooking a lot more...except when I need to use my stove.. which was ALWAYS. I hate my stove. I know that's a strong word, but I do not like it. It is electric and the heat distribution is so inconsistent. My food would sometimes come out burnt... and you know it wasn't MY fault. The culprit? 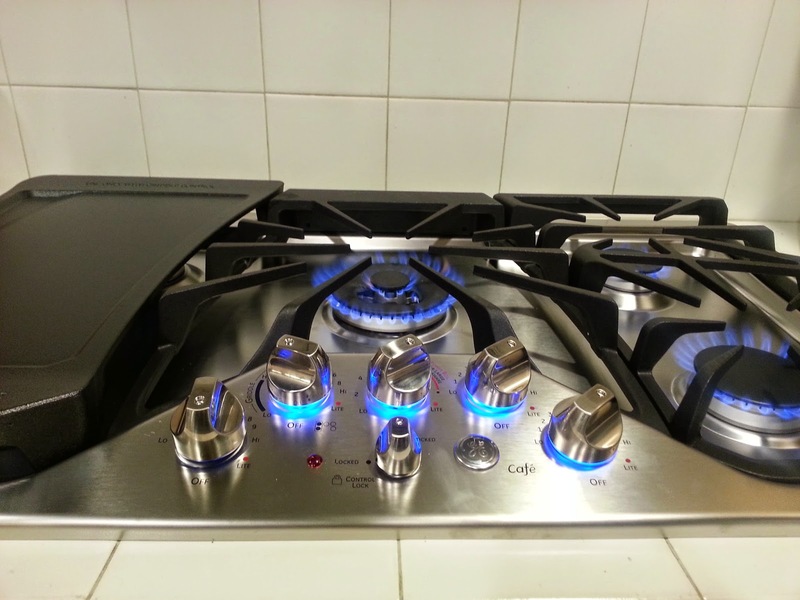 The STOVE!!! So my honey decided to surprise me with a new range for Christmas. I know that some say not to get appliances for Christmas, but I.LOVE.IT!!! Just look at her!! She's so purdy!!! I love my cast iron griddle, too. The blue flames are so fancy...cause y'know... orange flames are SO 2014! Ha! Last night I FINALLY finished my Houghton Mifflin reading series unit for 1st grade. Like I said earlier, it took forever to finish because I just couldn't find the time. Our school district has not adopted a new language arts curriculum and so we are still using the old Houghton Mifflin Reading Series from 13 yrs ago. It is not common core aligned. 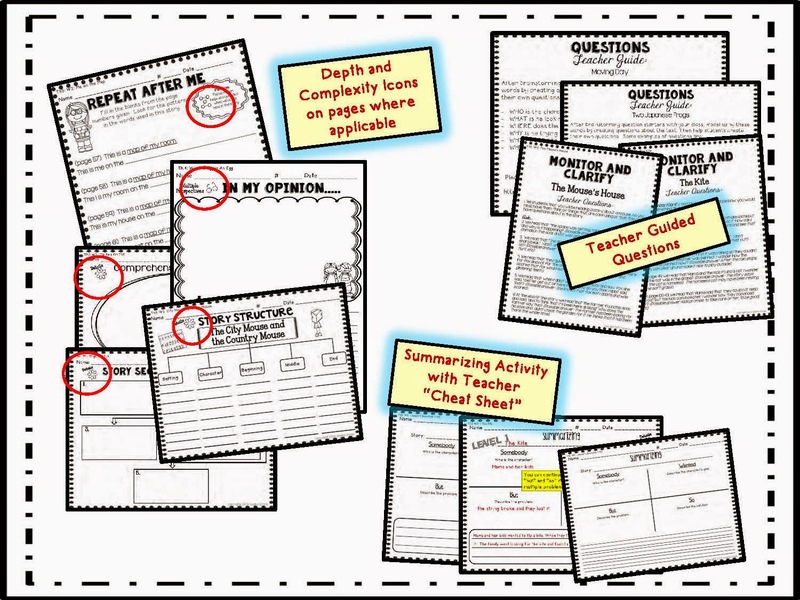 Needing to find something that was common core but not finding exactly what I wanted on TPT, Pinterest, Google, and everything in between, I decided to create my own resources that would satisfy the CCSS and be fun for my students. 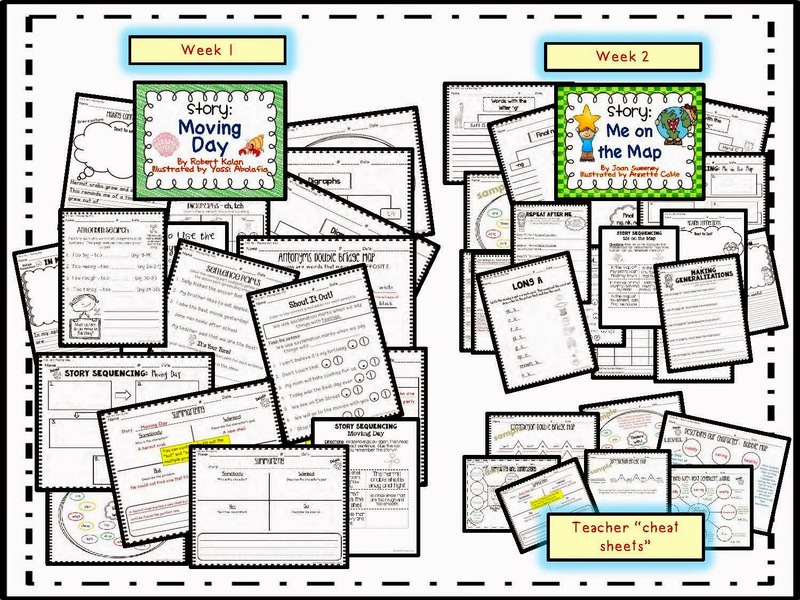 This was the birth of my HM common core aligned units. As I was creating all of the units for 2nd grade, I had teachers contact me asking if I would be willing to do it for other grades. I couldn't. I just didn't have the time. This year, I got assigned to a 1/2 combo and so it was perfect for me to add the 1st grade HM curriculum to my to do list. I love the activities in these units!!! They are fun and engaging and PACKED with higher level learning. 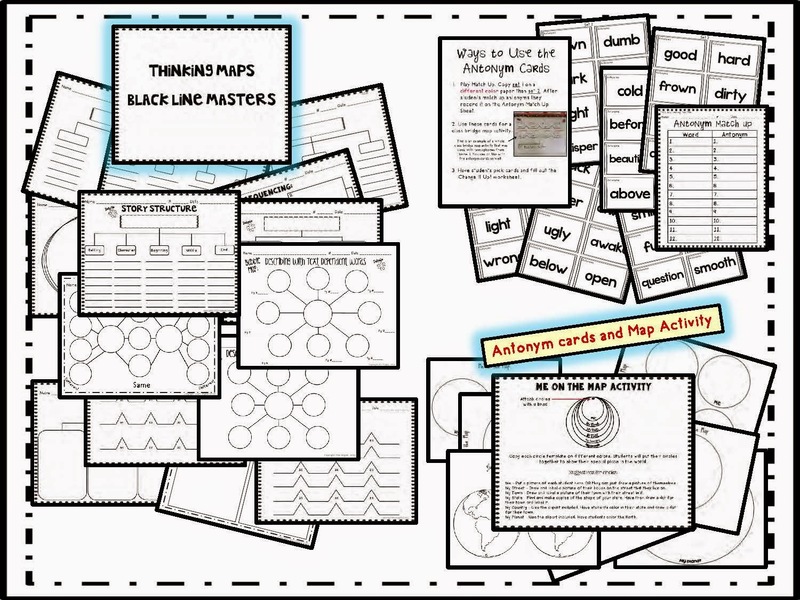 I have been trained in the Depth and Complexity prompts as well as Thinking Maps. I love them both and had to add those elements into my units. It's amazing what my firsties can do when the expectations are high. 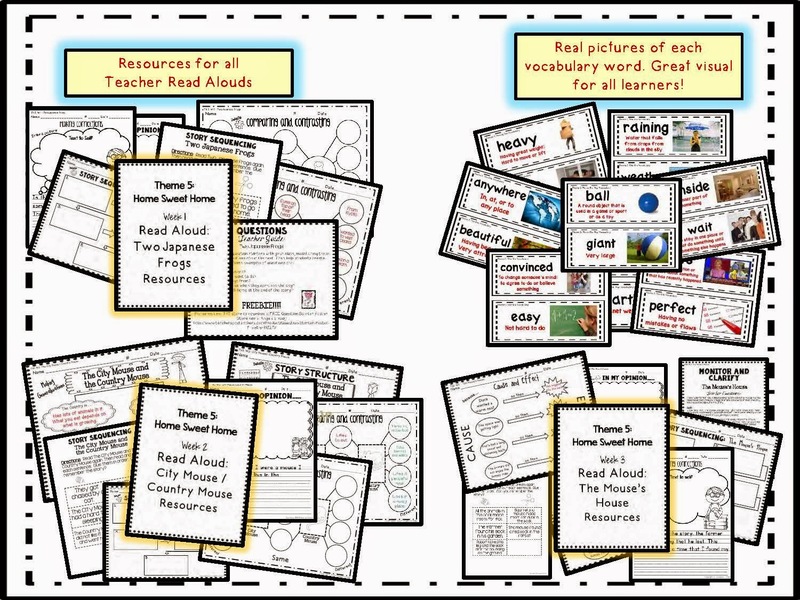 To celebrate the end of 2013 and the completion of my first grade HM Theme 5 product, it will be on sale (20% off!) TODAY ONLY! After the New Year strikes, it will go back to normal price. 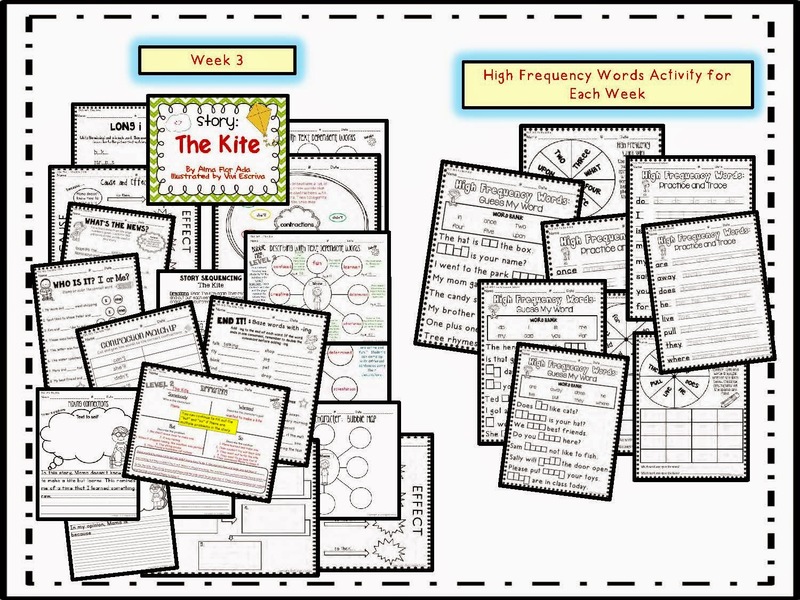 So if you know someone who is using an old HM curriculum, I would love for you to share this resource with them. Trust me, you will be friend of the year!!! It's no prep at all and makes the teacher life easier. AND us teachers love EASY, especially after the holidays! Here is a sneak peak of it. 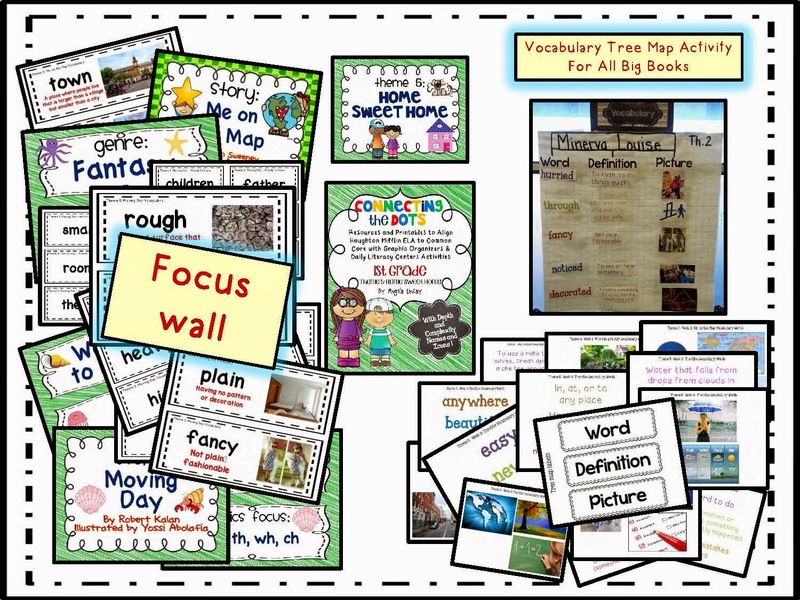 All the stories have colorful vocabulary cards with real pictures to illustrate the meaning of word. It's great for not only my ELLs, but for ALL my students! 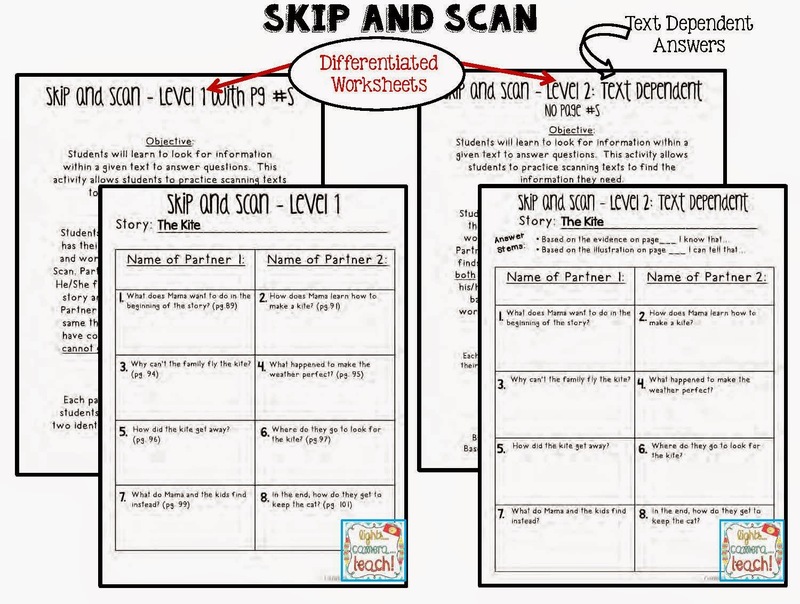 Thinking Maps are differentiated. 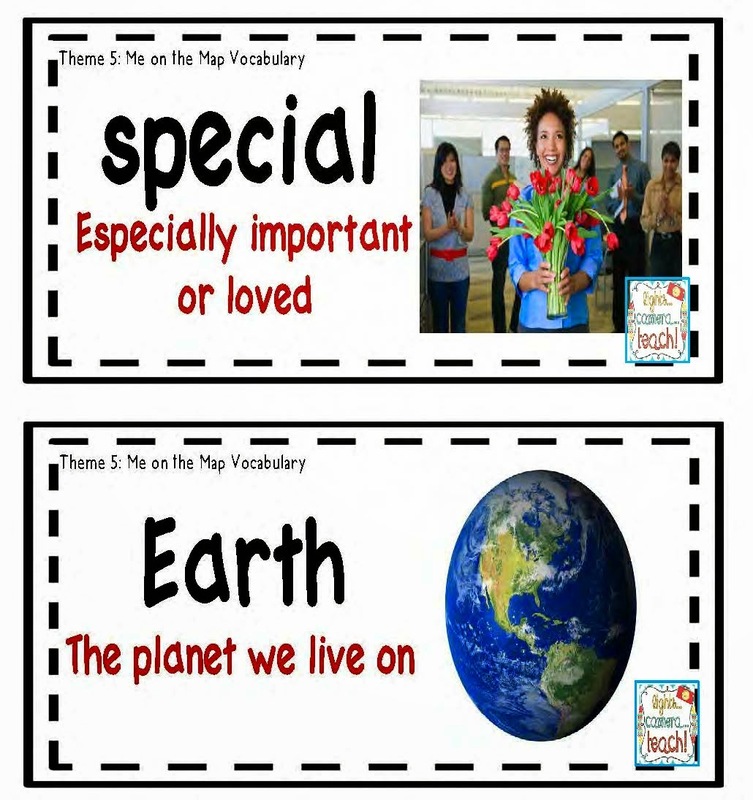 Level 2 requires text dependent words. 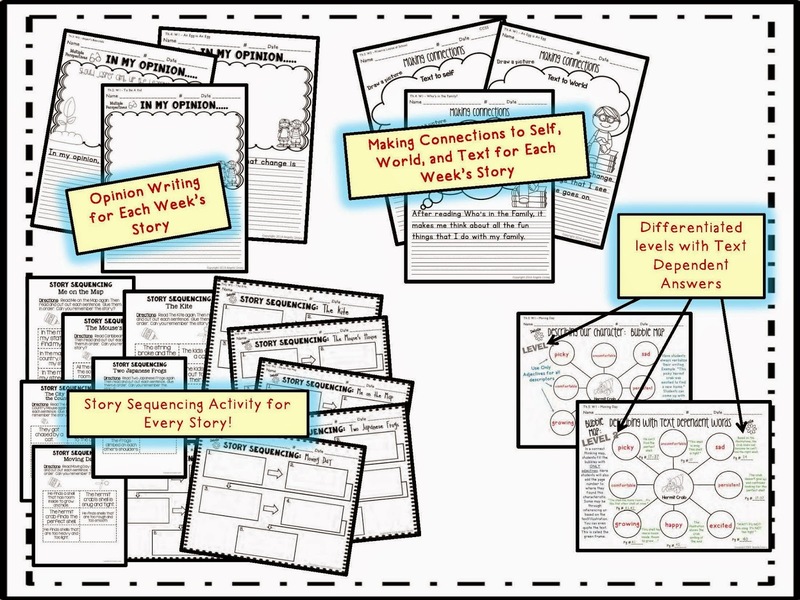 There are worksheets for the comprehension skill AND strategies for every story. 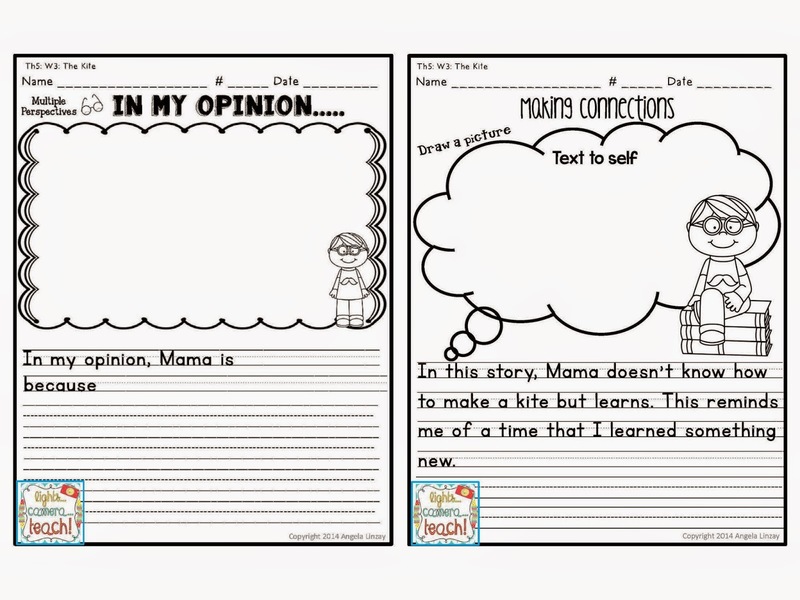 EVERY story (even Teacher Read Alouds) have an opinion writing and a text connection writing paper. Here are my firsties doing the Skip and Scan. I love that they are using their text and working together to come up with the answers. This is a closer look of their paper. This is Eric's paper. I have him circle his name because although he and his partner will have the same answers, EACH student is responsible for turning in their own work. Circling their name allows me to know whose paper it is. 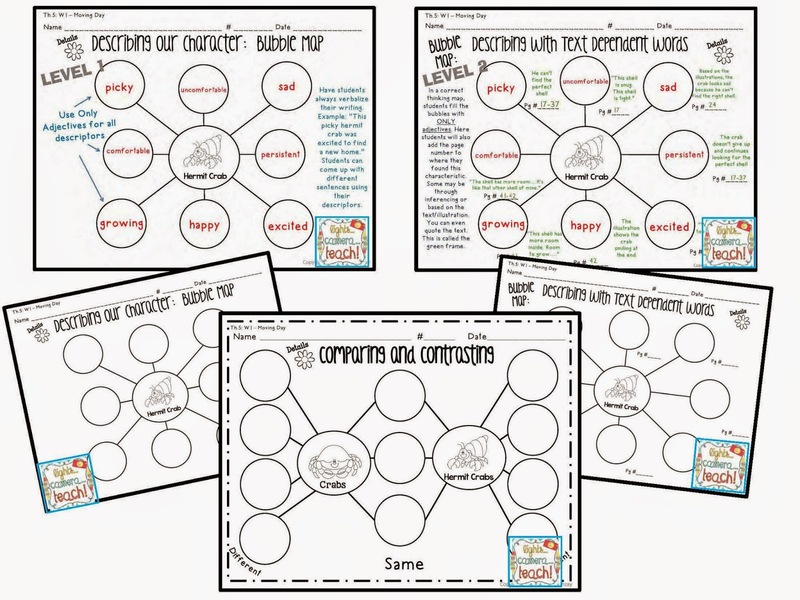 SO many fun and engaging activities in here that satisfy the Common Core Standards. Remember, it's only on sale TODAY...Dec 31. You can click on the link to take you to my store. 3. A Happy New Year!!! I'm hoping that you take the time this season to really recharge and clear your mind so that you can be ready when school starts again in 2015. Teachers really work so hard and I don't care what people say about working until 2-3pm and getting summers off.... we ALWAYS take work home with us...whether it's report cards, grading papers, searching on Pinterest or TPT for new and exciting ideas, or just worrying about the student who is having a hard time. Our job doesn't stop when we drive away from our schools. We are the ones educating our future generation. We are the ones that will teach our future president to read, we will teach the future doctors who will find the cure for cancer how to think at an early age. What we do matters and it's important. Thank you for all you do to reach your students. You are more valuable than you know!!! !